My husband birthday was a blast for us. 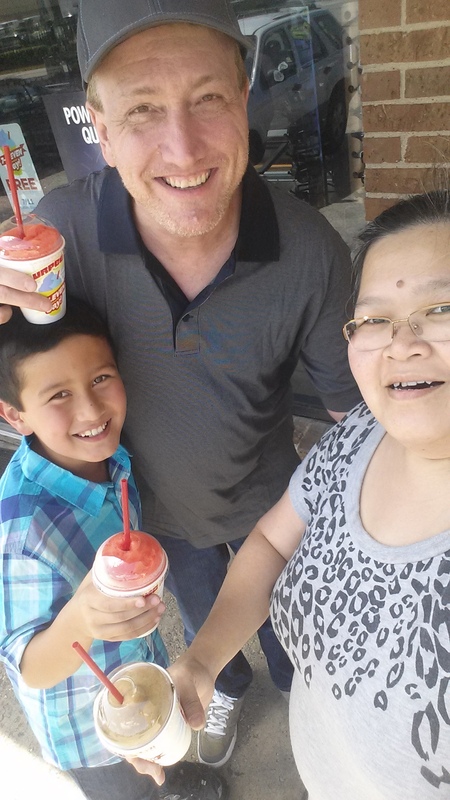 Not only I finally was able to create his pineapple upside down cake that he had been asking me to make, we got to stop by 711 to get our free slurpees. Yes slurpee with s. We stopped by at 3 locations lol. My son said to me..wow mommy is naughty. I was laughing and laughing… somehow getting free slupees and the idea of being naughty is so entertaining hahaha. Back to the pineapple upside down cake.. when he asked for it, he meant it literally upside down pineapple. I have been thinking on how to make this happen. His birthday was on 711 and it finally ding on me that very morning on how to do that. 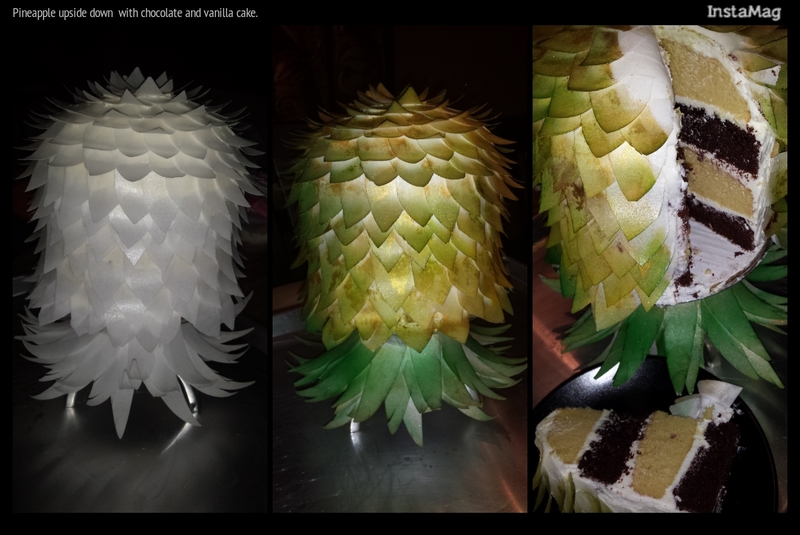 I decided to use wafer paper instead of fondant. 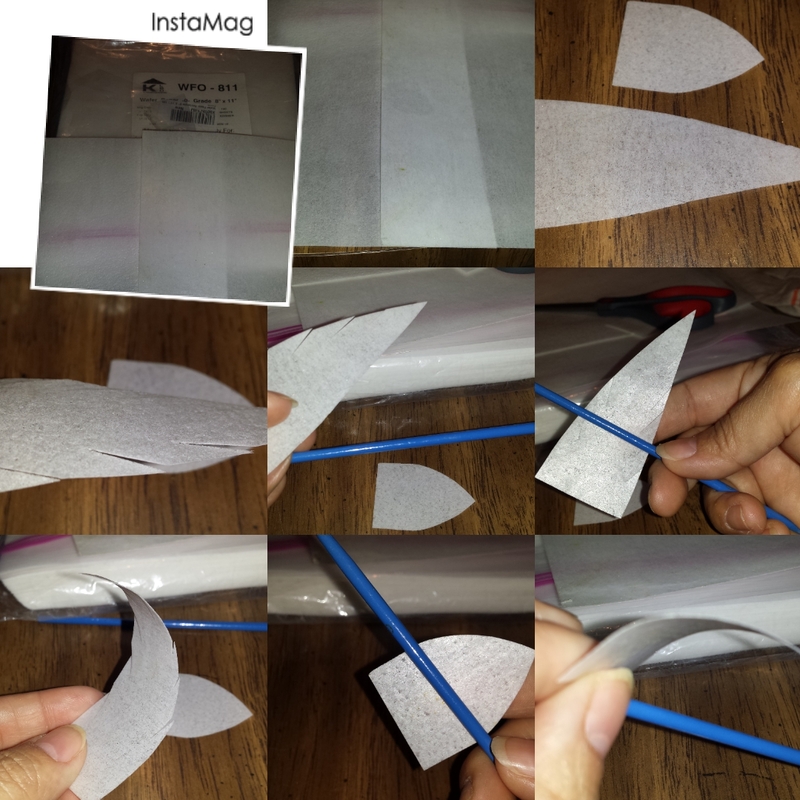 Never work with wafer paper before. I cut up some leafy like shape, curl it with the brush handle, stick them to the cake, which i put it on a candle holder I borrowed from my mother in law. Then, i sit back down, thinking..how am i gonna color this pineapple. As you probably know wafer paper is made of rice, so thin and fragile, so if i put liquid coloring, it will melt the paper. Think think think…. i grabbed my dust..grabbed my brush and started dabbing colors..i did gold, copper, moss. It’s soft looking…i was not liking it much. So I brave myself and took my airbrush tools…start with lemon yellow. I checked it…it looked better and did not make the paper melt. Contijue with the green and brown. 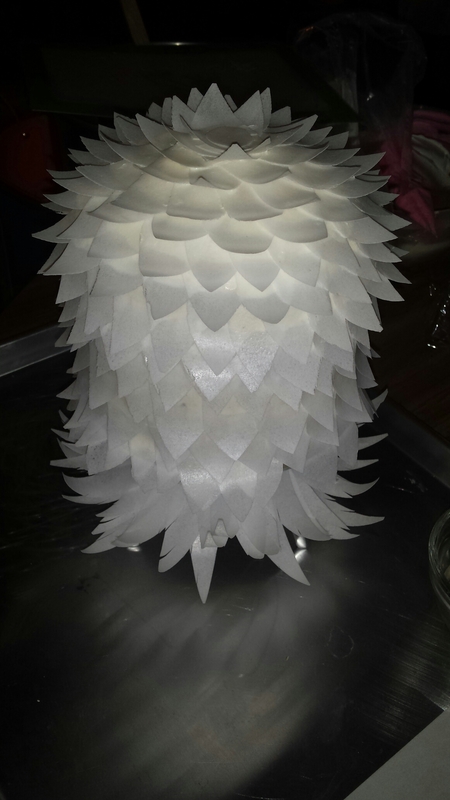 It looks like a pineapple lamp as it glows. Could be minions in disguise. That gives me idea for my next cake project. 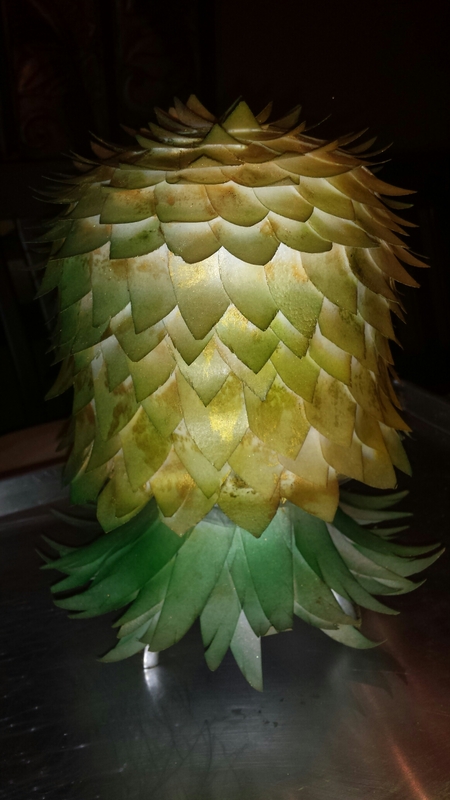 Here is the process of making the decorations for the pineapple upside down. If I planned better, I would have make the cake inside pineapple upside down cake with brown sugar frosting…yumm.